In this recording you will actually learn the Quantum Entrainment® process and then how to apply Quantum Entrainment® to overcome your financial worries, improve your job situation and dispel negative emotions and physical infirmities. You will even learn Space Walking, a radical new way of seeing your world that will generate fun and fulfillment in your everyday life. 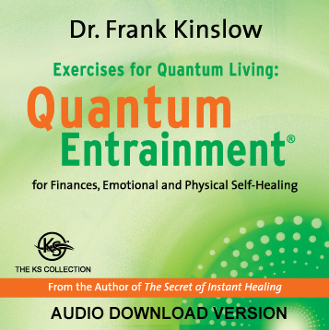 You will be personally guided by Dr. Frank Kinslow, the discoverer and only teacher of the Quantum Entrainment® process through the simple steps of each exercise. Under his gentle supervision you will begin to realize results from the very first session.